A great walk at any time of year. And a personal favourite of mine. 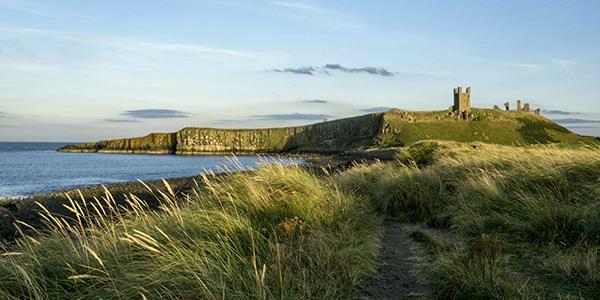 This 5-mile circular walk has a little bit of everything: coast, countryside and a stunning castle! It’s pretty easy going but will take you about an hour and 45 to complete. It’s definitely worth it, and can be tackled from either direction. We went clockwise so as to finish with the view of the castle just as the sun was setting. 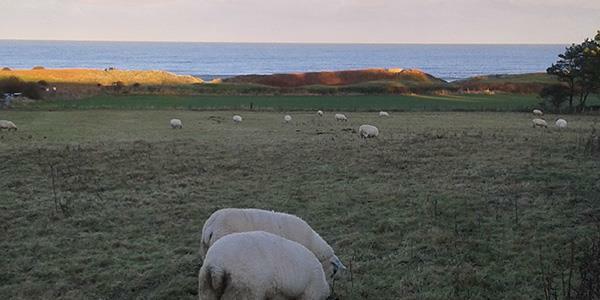 You’ll find a longer version of this walk in the Lucker Hall walks pack – it includes a little additional section up to the town of Embleton and this extends the route by another 2 ½ miles. You can find this at reception. Park in the Craster Quarry car park by the tourist information building off Windyside Hill. On the opposite side of the road is a wooden gate and a pathway. Follow that through the fields, there’ll be cliffs to your right. 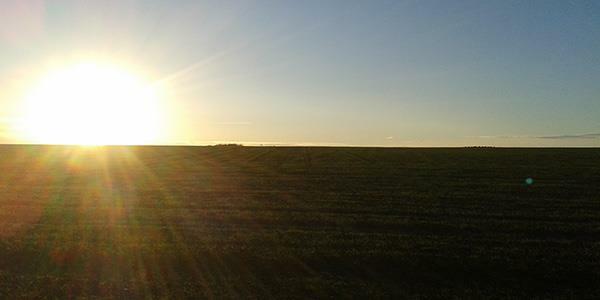 Enjoy wandering across the fields and bear to your left. You’ll be able to glimpse the tallest remains of the castle’s gatehouse peeping high behind you but, for the moment, you are heading in the opposite direction. Walk towards a large wooden gate and continue. You’ll see farm buildings ahead of you, make your way up the slope towards them and you’ll join a sturdier track leading you past them to the right. The path will take you all the way to Dunstan Steads. Fields stretch either side of you and the castle remains are across the countryside to your right, glimpsed through the gaps in the hedgerow. 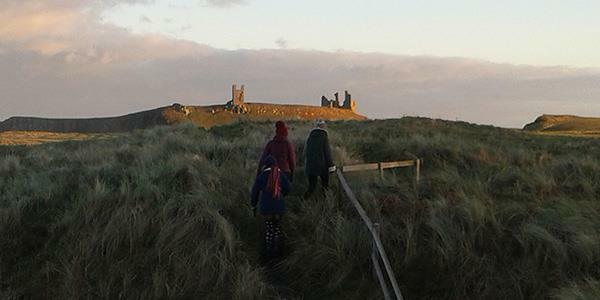 Walk around the large barn and past the pretty cottages, through another wooden gate and take the right hand turn that is signposted ‘Dunstanburgh Castle’ towards the coast. The soil will start to get sandier as you approach a little parking area and another wooden gate. Through here there is a golf course on your right, but you are making your way into the sand dunes where, before you hit the coast, a prominent opening on your right will lead you up into the dunes to walk high above the coast. 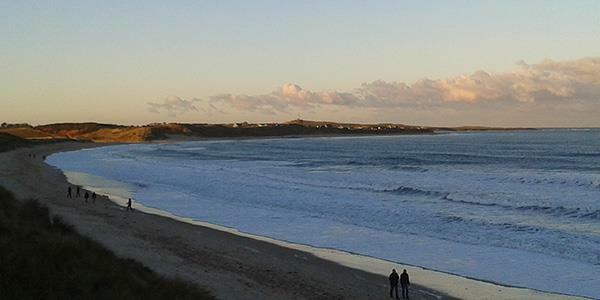 Incredible 360 views stretch from the looming castle in front of you, out over the beach and the large expanse of sea beside you, and to the cliffs of Embleton Bay, which dramatically frame the coastline behind you. As you make your way towards the castle, the sheer rock face of Castle Point becomes more evident, and Lilburn Tower is directly ahead. 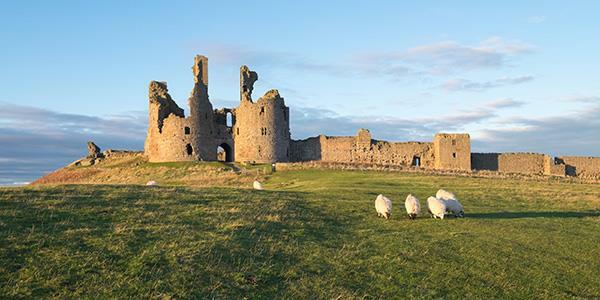 Protected from the sea and the cliffs to its north and east, this 14th century fortress was originally built by the Earl of Lancaster and is now cared for by the National Trust and English Heritage. If you want to explore inside the walls you’ll need to factor in a little more time, but it’s great to see it from the outside as well. You’ll make your way to the right, round and up to the front. Parts of the curtain walls still stand and the keep is very impressive. From here it’s just a straight walk across the fields, with the ocean on your left, the rest of the way to Craster. You’ll enter the village at the harbour. 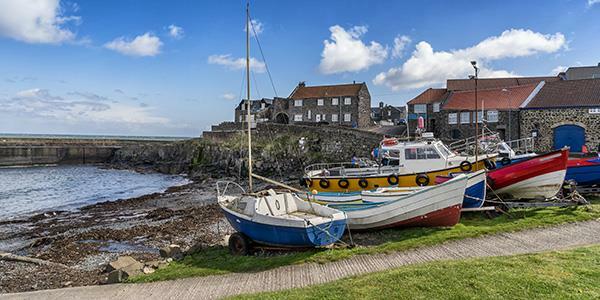 Follow the water into town, past The Anchor and the smokehouse to the Jolly Fisherman. Here you’ll be welcomed with a friendly atmosphere, good drink and excellent local food. The crab soup is particularly excellent! Opposite the pub there is a road that sweeps round and leads you right back to the car park. Enjoy! And let us know in the comments below how you get on.